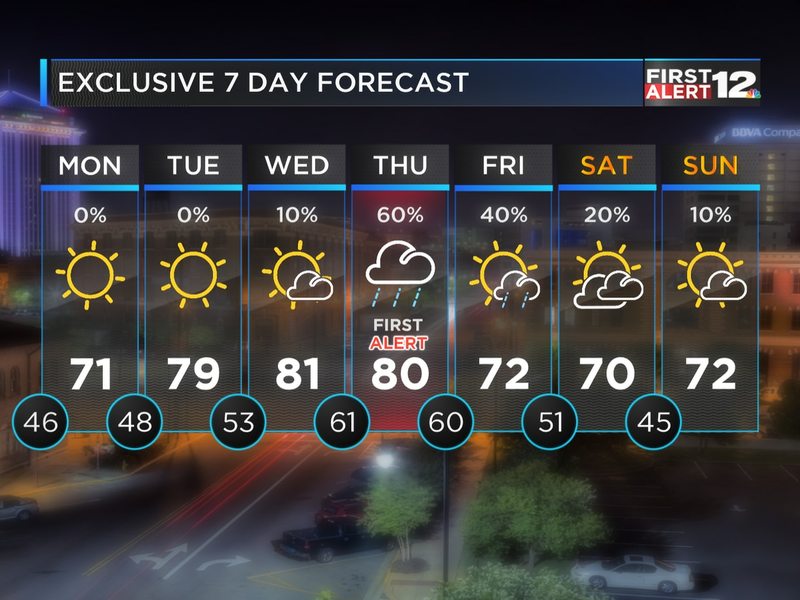 MONTGOMERY, AL (WSFA) - Besides a few isolated showers, the first half of the weekend is looking warm and mostly dry! By Sunday, however, some strong to severe storms could move into central and south Alabama. 80-degree heat returns Friday, accompanied by a few more clouds. A cold front will try to approach our area, but stall just north of us. A few showers are possible, mainly in central Alabama as opposed to south Alabama. All showers will be isolated in nature. Saturday will be similar to Friday. Temperatures will be warm again in the low 80s, and a few isolated showers are possible. Saturday night, all eyes will be to our west as a strong front approaches. A negatively tilted trough will swing through our area, and a decent amount of instability and shear will create the possibility of strong to severe storm development. 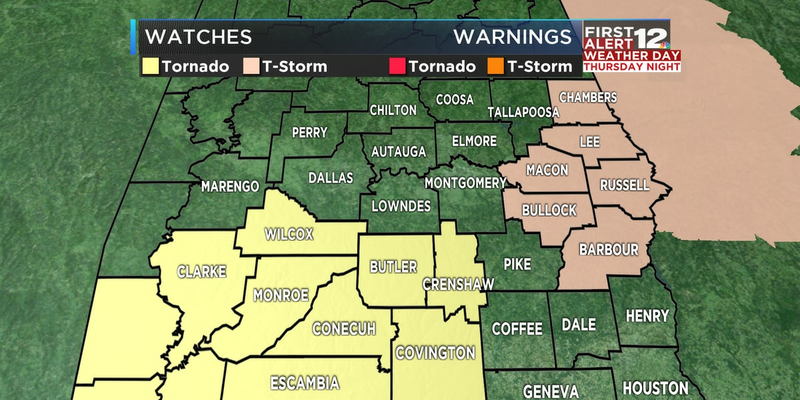 Potential threats include damaging wind gusts and tornadoes. Potential Arrival Time of Storms: Timing is not nailed down yet, but this is our first estimate of earliest to latest times storms could be in your area. This will be fine-tuned as the storm system moves closer. Timing isn’t nailed down yet. Models are showing storms potentially moving in as early as 4 am Sunday morning in western counties and exiting as late as 4 pm Sunday afternoon in eastern counties. This is something we’ll be able to fine-tune as the front moves closer. 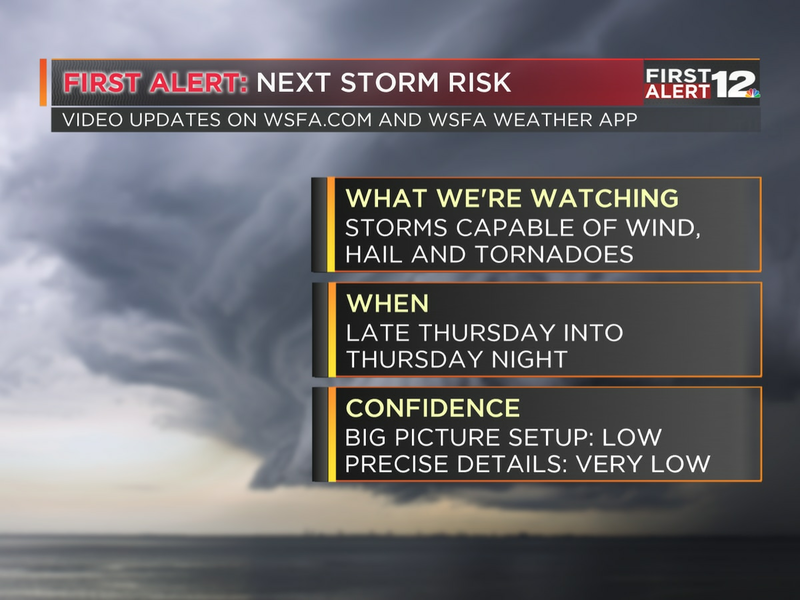 Make sure to check back in for updates here on the website, on our First Alert Weather App and through our newscasts.